It’s no secret that the medical school application process is a long and difficult road. Although many pre-med students now take gap years before medical school, their college experience is usually focused around the end game of becoming doctors. If you have had your eye on this goal, you know that the challenge of earning your white coat is just beginning. After spending most of your college experience struggling with required pre-med classes and committing every extra hour you have volunteering, researching, and shadowing, you are finally ready to start the notorious medical school application process. Applying to medical school typically takes from nine months to a year! So, when should you begin? How does the process work? 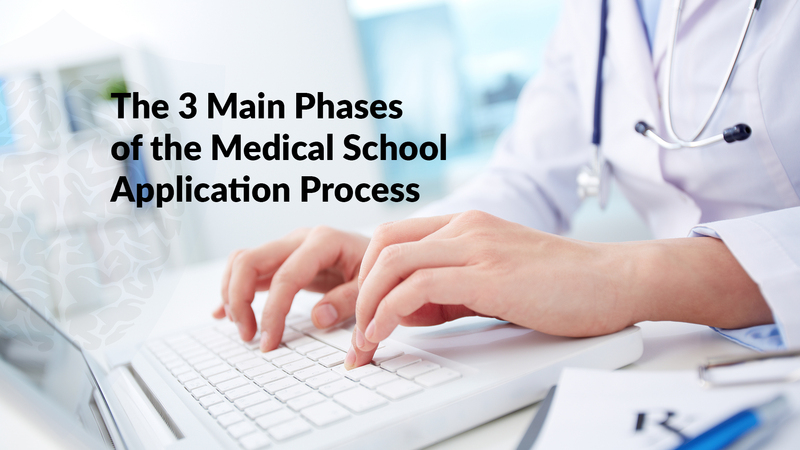 Here’s a step-by-step outline of the medical school application process in 3 main phases. If you are currently applying to medical school, then you should be working on your primary application right now. For the vast majority of medical schools, you will use the American Medical College Application Service (the AMCAS) to start the medical school application process. All of the information that you input into your AMCAS will be sent to every medical school that you apply to. Think back to the Common Application for college admissions – same concept here! Let’s break it down a bit further. This year, the AMCAS opens for submission on May 31st and operates on a rolling basis. The earlier you submit, the more available slots there are in medical school classes, and the higher your chances of admission. Be strategic and have all components of your application ready to submit on May 31st. You are welcome to send your application without all of the materials (i.e. your MCAT score), but admissions officers will not read your application until they have all parts. You will be required to fill out your entire college academic record for the medical school application process. Medical schools will scrutinize your transcript, looking to see that you took all of the necessary pre-requisite courses. I’m sure you’re aware that your GPA is a significant factor here, but it is not the only one. Many students worry about having a low GPA, but what you lack in GPA can be made up with your MCAT score. Receiving a high MCAT score is crucial for demonstrating your academic qualifications for medical school, but don’t overdo it and take the test repeatedly. Be aware that every MCAT score that you receive will be reported and considered! With the opportunity to list 15 activities, this section will take up the majority of your primary. For each experience you enumerate, you also write a 700 character description (1325 characters for your “most meaningful” activities). With your AMCAS activities, it’s important to provide concrete examples, discuss tangible achievements, and illustrate your sustained involvement so that medical school admissions committees can see that you have a positive impact in your community. You have up to 15 spaces available for your experiences, but don’t just list something for the sake of taking up space. Medical school admissions committee members will absolutely see through attempts to just stuff your list with fluff. Within this section, you also get to select “three most meaningful activities” and expand on their descriptions further. Reflect on how these activities have helped you grow and bolstered your love of medicine. Be strategic with which experiences you choose; make sure they align with the rest of your application. If your personal statement is about your love of working with children, it’d make sense for your most meaningful activities to reinforce this passion. Think about the narrative of your entire application when shaping your activities and experiences section. This is probably the most important part of your primary application. With just 5300 characters (yes, that includes spaces), you need to show who you are, why you’re passionate about medicine, and why you are a unique candidate. There are many ways to approach the personal statement, but here are 16 questions to help you critically think about why you want to help others. Before you select a topic, make sure it is a sound one by reading our blog on the 6 medical school personal statement topics to avoid. In your letters of recommendation, a third party weighs in on your academic and personal achievements. It’s a valuable chance for others to vouch for what an amazing candidate you are. Check to see if your school provides committee letters and then provide them with the necessary materials. Make sure you ask your professors, supervisors, employers, counselors, mentors, etc. with plenty of time to spare before you need them to submit their letters! How would you contribute to the diversity of your medical school class? What did you do in your gap year? Select one of your activities and explain in greater depth how it developed your love of medicine. What are your long-term goals? What medical specialties interest you? Explain your research in more detail. Explain a difficult situation that you were in and how you dealt with it. Secondaries will appear in your inbox during the summer and you will likely become overwhelmed with the sheer amount of writing required during the medical school admissions process. The sooner you return your secondaries, the more interested you appear to the school. Be strategic in which schools you choose to work on first - don’t just focus all of your energy on your reach schools’ secondaries. Give the less competitive schools on your list some love to ensure that you have more options on the table! The last phase of the medical school application process is the interview. Receiving an invite for an interview is considered a huge accomplishment! But the competition remains fierce. Admissions officers usually cut about 50% of applicants after the interview. In order to be successful, you need to practice with mock interviews. Not only is the process competitive, but the format of medical school interviews makes them particularly rigorous. Interviews can cover anything from ethical dilemmas to current events, requiring in-depth preparation. Before going for your interview, do research to see what style of interview the school uses and what types of questions you can expect. Some schools conduct traditional interviews, while others use multiple mini interviews (MMIs). There are thousands of possible questions that they can ask you, but here’s 95 of the most common medical school interview questions to get you started. The medical school application process has many components to keep in order, but with diligence you’ll reach your end goal! Since medical school operates with rolling admissions, it’s important to stay on schedule. The sooner you finish each phase, the stronger your chance of admission. Create a work timeline, stay organized, and the time and effort should pay off in the long run!